Have you ever noticed that if you look closely at the planets in our solar system, the different atmospheres create a marbled look about them? 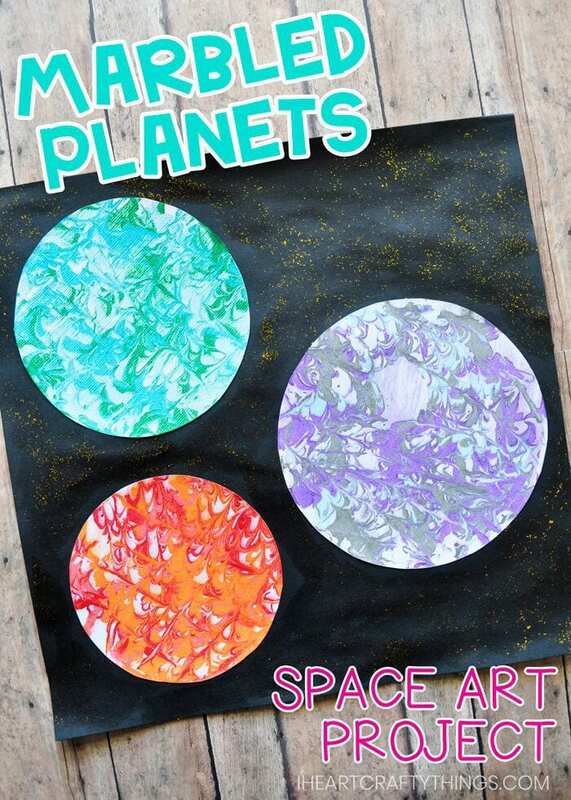 The marbled planets among the stars inspired my daughter and I when we were creating this preschool space craft. 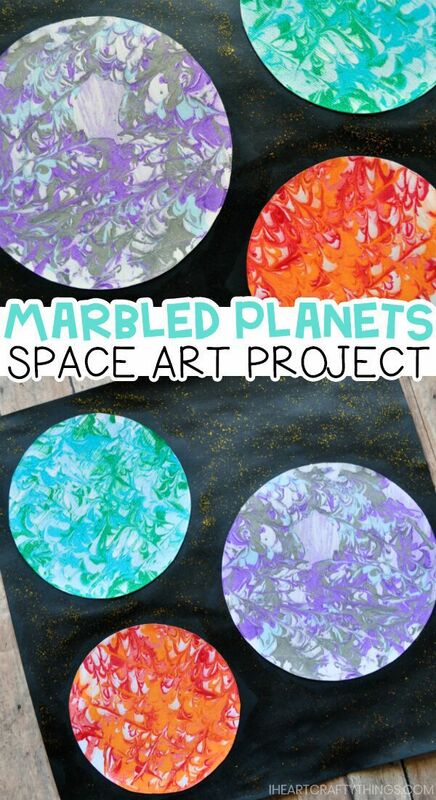 We used the popular marbled shaving cream painting method to replicate the look of the marbled planets and then set them on a black background with gold glitter “stars” to really make this beautiful Marbled Planet Artwork stand out! 1. Start by cutting 3 different sized circle shapes from your white cardstock paper. I used different sized cups, bowls and containers to trace my circles. It really helps with keeping things uniform! 2. Squirt shaving cream into the foil containers, enough to fill the bottom of the pans. Use your rubber spatula to spread the shaving cream out evenly and make it as smooth as you can. The kids will have fun doing this part, just make sure you do the final once over. 3. Squirt various colors of acrylic paint onto the shaving cream. It seems to work best If you squirt the paint in lines of various directions. Use a toothpick to create lines up and down, side to side and diagonally. You want to end up with a marbled look in the paint as this is the design you will be transferring to your planets for your preschool space craft. 4. 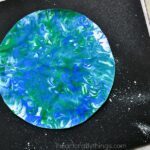 Press the circle down into the paint and lightly rub all over the circle to get the shaving cream to stick to the entire circle. Carefully remove the circle from the paint and let it sit for 1-2 minutes. Use your squeegee to remove the excess shaving cream from your circle. You are left with a beautiful marbled planet. 5. 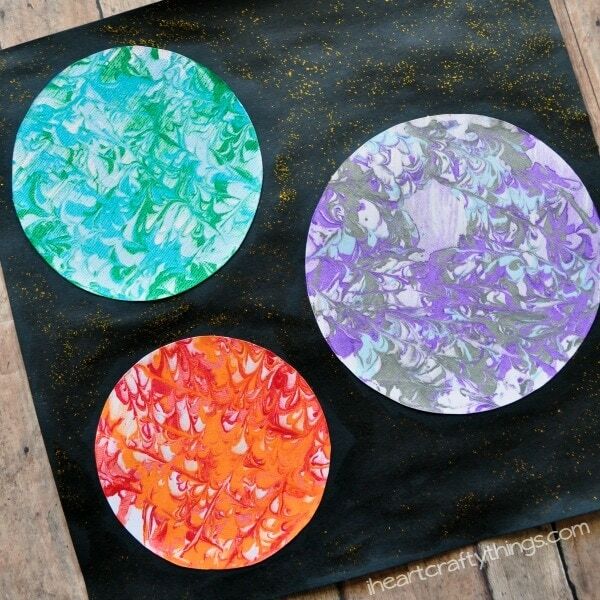 Adding your marbled planets to black cardstock will help give the impression that these planets are in space. 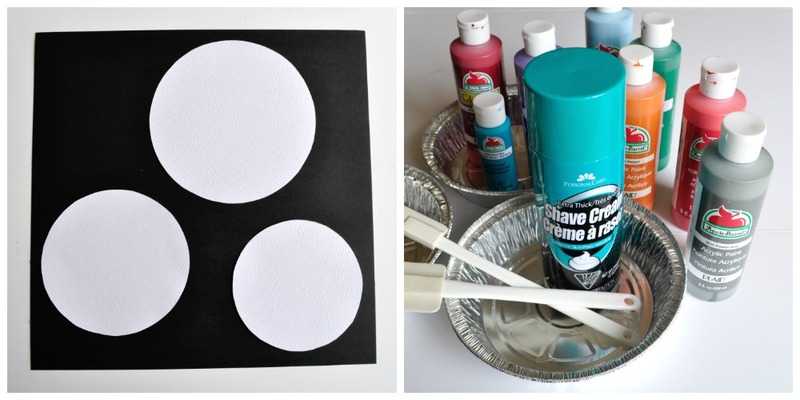 After the painted circles are dry, simply glue the planets onto black cardstock paper. 6. Although this last step is optional, the gold glitter really gives is the perfect finishing touch. 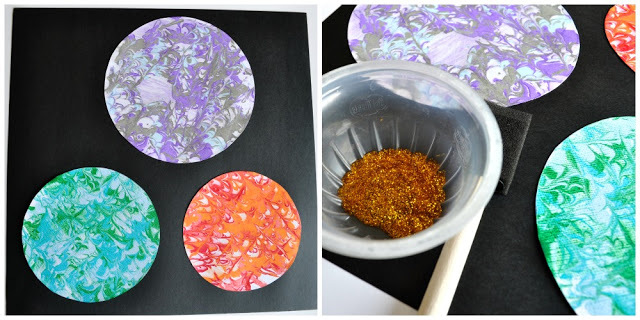 Using a brush, paint some gold glitter glue all around the planets, just on the black part of the paper. The glue adds a bit of shine and the glitter makes it looks like little stars. 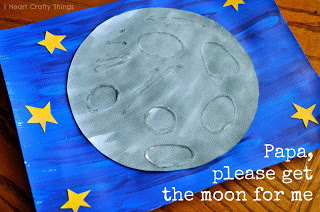 It’s just what your preschool space art needs! 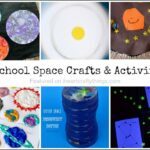 What do you think of this space themed art project? Do you think your little astronaut will like it? Does the shaving cream marbled painting technique replicate the real look of the planets in space? Comment below! 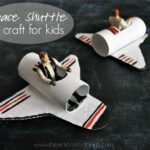 Love these, they look awesome and so fun to make! I love these planets! If you can believe it we have only painted with shaving cream once…and it was years ago! I am pinning this for our Outer Space week…thanks friend! @Katie A Little Pinch of PerfectThank you Katie! @ToniiThanks Tonii! It had been quite a while since we have painted with shaving cream too. It was fun to try it out again! I you do this with a class, how many can you make until you have to make another batch? I need to know how many cans of shaving cream I would need for a class of 20. We usually only use the batch twice and then remake it. After two times the marbling effect doesn’t turn out great at all. This looks lovely! Are you able to dip more than one piece of paper at a time or do you have to redo the pie tin each time someone puts their paper in it? I am thinking of trying this with a class of 10. Thanks so much! Hi Jessica, Sorry I haven’t gotten back to you! We usually use the pan for two and then remake it. After two, the marbled pattern isn’t that great. Hope that is helpful! This is lovely. My Preschoolers will love making it. Thanks.